Santos put in all-hands-to-the-pump performance and clung on to their first leg lead in tense and dramatic fashion to beat América from Mexico 1-0 on aggregate. They now progress to quarter finals of the competition where they will probably face Cruzeiro and their deadly marksman and intimidatingly named…… Wallyson. There was no beautiful game tonight. In the second half, América must have had more than 70% ball possession. Santos just couldn’t hold on to the ball. Some of this was nerves, some of this was tactics, some of this was tiredness and some of this was due to player injuries. I don’t suppose anybody at Santos cares about the performance though and Muricy seems to be imposing his hard to beat, grind-out-results style. 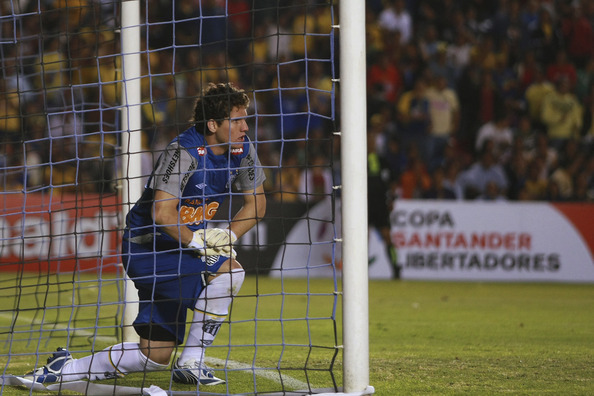 Santos keeper Rafael made countless spectacular saves in the second half. He followed each save with hands in the air and a thank you to god. Nice religious young lad but it started to get a bit annoying for my liking. Nobody is more religious than the Mexicans. So, if God had really wanted the ball to go in, it would have, okay Rafael?! The match was tense. Apart from the incessant América pressure on the pitch, somebody in the stadium had a loud horn which sounded something like a tsunami alarm (at least what I think a tnsunami alarm must sound like). Whoever got hold of this horn, I’ve got no idea and why stadium security didn’t stop him from using it, even less. Talismatic midfielder Elano was ruled out of this match after picking up an injury against São Paulo on the weekend. Zé Eduardo was a disaster up front and hauled off in the second half. Captain Edu Dracena might have broken his nose judging by the amount of blood gushing from it. He was taken off. Arouca was stretchered off with an injury. In the end, a tired looking Ganso was playing up front with Neymar, backed up by three defensive midfielders and five defenders. As I said, it was not pretty stuff. But after a 16 hour trip, playing at altitude, away from home in, basically, a different continent, three days after a high pressure State Championship semi-final against São Paulo, I think it’s fair to say that the result was the most important thing. So, well done Santos. This entry was posted in Libertadores and tagged America, Ganso, Libertadores, Muricy, Neymar, Rafael, Santos, Zé Eduardo by Brian Davidson. Bookmark the permalink.